To save your site from a crash, you should back up your WordPress website regularly. There are many reasons for data loss, for example when your website is hacked or you deleted content accidentally. In this case you need to recover your website before these things happened – a backup previously done before can help you with that. There are many tools, that can create backups and restore them. For databases, you can use phpMyAdmin or the WordPress plugin Adminer. For files, you can use the FTP program FileZilla. You need some experience on these things. It also takes you some time to get everything together and you will not do it regularly. You don’t need to struggle with all that, as there are automated solutions, like BackWPup! After a one time setup, backups are done regularly by the WordPress system and you can sleep well at night. The backup plugin BackWPup can be used to save your complete installation including /wp-content/ and push them to an external Backup Service, like Dropbox, S3, FTP and many more, see list below. With a single backup .zip file you are able to easily restore an installation. BackWPup is available as a free version as well as a paid Pro version. Please note: the free version offers not the same support as the BackWPup Pro Version. With our Pro version, you get first class support and more features. 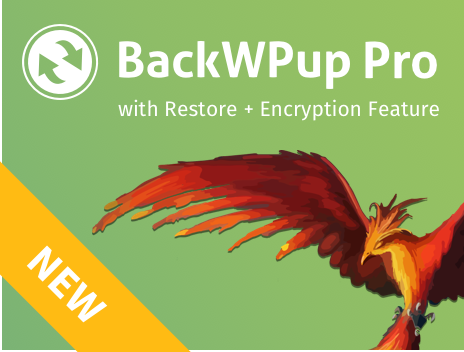 A comparison of the free and Pro version can be found at the article “What is the diffrence between BackWPup Free and BackWPup Pro” in our documentation.